White-haired, thin and bent at nearly 90, Fidel Castro in person is a faint echo of the man who remade his country, defied the United States and fueled socialist uprisings around the world. But 10 years after he handed control to his brother Raul, Cuba's former leader has taken on a powerful new role in a country suffering an economic crisis and debating its direction in a new era of normalization with Washington. After a decade out of the public eye, Fidel Castro has surged back in the run-up to his Aug. 13 birthday as the inspiration for Cubans who want to maintain strict Communist orthodoxy in Cuba in the face of mounting pressures to loosen political control and allow more private enterprise. "We reiterate our commitment to stay faithful to the ideas he's fought for throughout his life and to keep the spirit of resistance, struggle and dialectic thought alive," Jose Ramon Machado Ventura, the hard-line second secretary of the Cuban Communist Party told the nation Tuesday at the celebration of Castro's 1953 attack on a government barracks. The peak of Castro's return to public prominence came April 19 at the closing session of the Cuban Communist Party's 7th Congress. The three-day gathering featured a string of speeches denouncing President Barack Obama's visit to Cuba the month before, in which the U.S. leader called on Cubans to look toward a future of reconciliation and greater freedom. Castro opened with a defense of his communist ideology, declaring the Russian Revolution of 1917 to be "a grand social revolution that represented a great step forward in the fight against colonialism and its inseparable companion, imperialism." 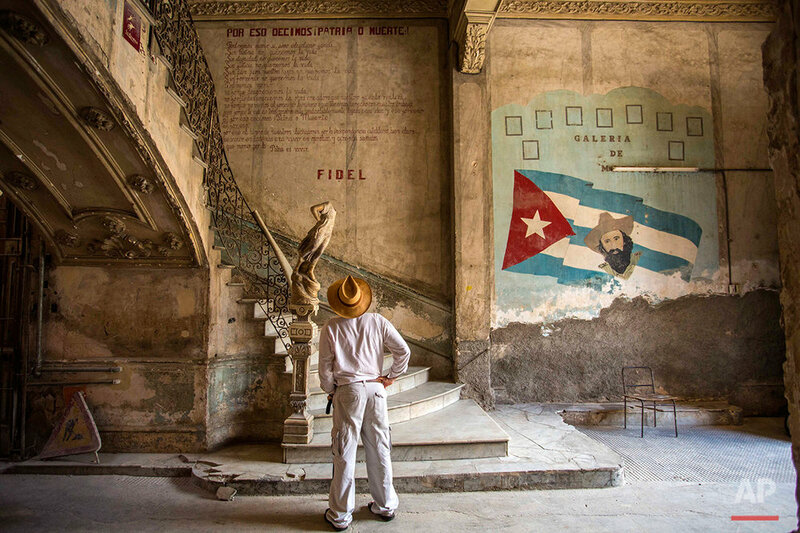 During 47 years in power, Fidel was a constant presence for Cubans but prohibited the statues, portraits and other tributes beloved by other total leaders. Today, his image is everywhere as the country fills with tributes to him on his 90th birthday. Fidel is now mentioned by hardliners in the same breath as Jose Marti, the 19th century poet and revolutionary fighter whose status is similar to that of the founding fathers in the U.S.
"In the ideology of Marti, and the path of Fidel, we've been warned about the need to prepare ourselves for a war of ideas, and to be informed, so we can't be confused," the head of Cuba's official journalists' union wrote Sunday. "We have the historic privilege of having shared our fate with Fidel." The editorial went on to reject a series of recent calls by young journalists for greater freedom to work for the foreign press. "There isn't the slightest doubt that conservatives who don't want to advance look for backup in Fidel," Cuban political scientist and former diplomat Carlos Alzugaray said. "There's been a backlash from all of those who fear change." There are billboards across the country with Castro's portrait and best-known phrases. State television is filled with interviews reminiscing about his time in power. Cultural events are dedicated to him. There's a newly created government email address to send him best wishes on his birthday. A group of students in the central city of Santa Clara even developed a mobile app allowing users to pull up quotations from his written works and speeches. His family home in the eastern city of Biran has been refurbished and planted with trees. "I've lived through everything and I can tell you that there'll never be another like him," said Sara Castillo, a 77-year-old retired nurse. "May he have more years of life and health. He should be the guide for all Cubans." But the celebration comes at a tough time for Castro's dreams of creating a socialist paradise and setting off a leftist wave sweeping Latin America and the rest of the developing world. Cuba has seen allies ousted in Brazil and Argentina and its prime patron, Venezuela, has cut the supply of subsidized oil to Cuba, leading to a cash shortage that's increasing public dissatisfaction, particularly among the young. "I'm not interested in Fidel Castro or politics," said a 21-year-old unemployed former engineering student who spoke on condition of anonymity for fear of official retaliation. "They're the past of this country." He said he wants to emigrate as soon as possible to be with his girlfriend in the United States and have a better quality of life. Other young people say they appreciate Castro, but want their country to focus more on its future. "He's the father of a whole generation of Cubans, an important figure, even though there are people against him and people in favor," said Denet Hernandez, a 29-year-old doctor. "But the youth want to take the reins of their own time. It's not denying history, but continuing forward." 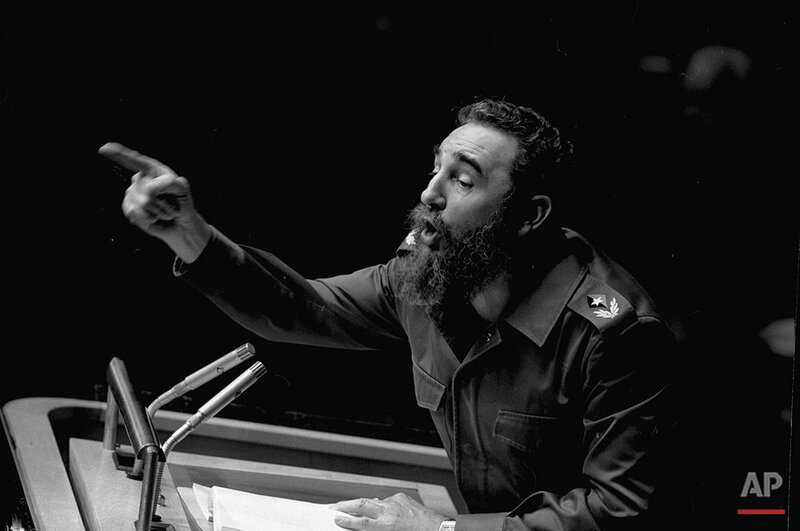 Below is a gallery of photos from our archive featuring Fidel Castro through the years. Text from the AP news story, At 90, Fidel Castro is symbol of Cuban resistance to change, by Andrea Rodriguez.